The core MGF body structure - largely shared with the later MGTF. The green areas are the sill, A- and B-post structures that are key to the whole body's strength in torsion and bending. The yellow-coloured windscreen rail also plays a role, along with the bonded-in windscreen itself (not shown). When the MGF was launched back in 1995, much was made about the car's torsional stiffness. At that time, the MGF was the stiffest affordable roadster you could buy - piping the MG's most important competitor, Mazda's MX-5, into second place. Other than playing 'Top Trumps' using torsional stiffness numbers, what is torsional stiffness, and what does it mean to your car's performance? Torsional stiffness effectively defines how strong the body of the car is - how much it resists twist. The typical unit of measure is Newton metres (Nm) per degree, which gives a good clue as to how torsional stiffness is measured. If you tried to rotate the front of the car in the opposite direction to the rear about the long axis of the vehicle, the unit of measure gives you how much force is required to achieve one degree of twisting motion in the body shell. Unsurprisingly, the higher the torsional stiffness figure, the stiffer the car. Torsional stiffness is felt in a number of ways. The classic manifestation, particularly on a roadster like the MGF, is what is called 'scuttle shake'. You may already have noticed this on your car - it's where the windscreen appears to move at a different rate to you, and is typically noticed over rough road surfaces. If there is a lot of scuttle shake due to low torsional stiffness, you start to notice that the whole body of the car is 'alive' and tends to move about in sympathy to the shocks being transmitted through to the cabin: it has quite a negative impact of your perception of ride quality. The other way you notice a problem with torsional stiffness is with handling. If the body is moving in response to suspension movement, the suspension system's geometry is not working as it should - body movement is not usually considered an active part of vehicle suspension systems! Therefore, to get the best possible handling out of your car, it needs to be as stiff as possible so that the suspension pick ups don't move about. You may have read in motoring magazines, such as Autocar, that saloon cars tend to handle extremely well - this is in no small part due to the torsional stiffness that an enclosed body shell provides. It would appear that the MGF is a good performer in its class when it comes to torsional stiffness - so what's the problem? For me personally, one of my bug-bears concerning the MGF's handling characteristics is steering feel. There simply isn't enough. I've worked hard over the years looking at ways of improving the situation - which have all worked after a fashion (including being able to disable the EPAS and fitting a TF steering rack), but still, the steering tends towards the inert rather than the involving. That, combined with the fact that my dear old F is now over 10 years old means that the body is past its first flush of youth. I don't suppose for one moment that this dear old F on my drive has its full compliment of Nm/degree stiffness that it left Longbridge with in 1995. Notes: Included here as a baseline representative of how stiff modern saloon cars are these days - the ZT is nearly three times stiffer than the its MG roadster stable mate, the TF. Notes: Nearly three times stiffer than the car it superseded, the Z3!!! Notes: Sales literature suggests TF is 20% stiffer than MGF, which gives us an estimated torsional stiffness of 8500Nm/degree... therefore remains class competitive with the newly launched MX-5! Notes: Stiffest roadster in its class at launch - and surprisingly remains competitive even now. Notes: used as bench mark for MGF chassis development - 6000Nm/degree used as target stiffness for MGF. Notes: Not what you'd call the "Ultimate Driving Machine" with this torsional stiffness! This is, I accept, a rather random table of roadsters - but these are all the figures that I could find off the internet (if anyone knows the torsional stiffness of the Fiat Barchetta or Alfa Romeo Spider, please do let me know!). Compellingly, cars of the MGF's generation populate the bottom half of this chart. The MGF started off with a commendable 7100Nm, besting its Mazda and BMW competition (the latter must have irked some inside BMW - remember that Rover Group at the time of the MGF's launch, was wholly owned by BMW!). But since then, the competition has leap-frogged the F - the new Mazda and BMW roadsters are now offering much higher levels of torsional rigidity - the new Z4 being particularly impressive in this regard. Intensive analysis of the MGF body structure identified key improvements to body stiffness to seek ways of adding to the improved chassis precision and ‘feel’ of the new TF. On-road testing with accelerometer measurement was related to laboratory rig testing and extensive computer modelling. The resulting package of improvements offers significant benefits in both measured and perceived robustness. In addition to the solid mounting of both front and rear subframes, the front subframe has a diagonal cruciform tubular brace on the underside, linking its four-corners to the floor pressing of the under bonnet area. The bracing behind the centre fascia console from the floor tunnel to the substantial cross tube that carries the steering column has been considerably strengthened. There are two bolt-on tubular braces arranged in triangular form across the top of the engine bay. Combined with the new, re-shaped and one-piece outer sill and rear wing pressing, these items improve the torsional stiffness of the shell by 20%, and reduce scuttle shake. Interestingly though, so too has the MG TF - the newer model being usefully stiffer than its erstwhile ancestor. Fundamentally, there actually isn't that much difference between the body structure found on the TF when compared with the MGF - which is pretty evident when you look to see the extent of bodywork panel commonality. Front wings, bonnet, windscreen surround, doors are all items that are identical, and where removable, could be fitted to either car without modification. And yet, the TF manages to be a claimed 20% stiffer in torsion than the earlier car. How was this achieved? On looking at the outside of the TF, it is pretty obvious that some of the panels have been altered - and this includes the one-piece TF sill/rear wing section - a component that is made in two parts on the MGF. But the changes are more than skin deep: another new process is in the construction of the A-posts. Precisely made three-dimensional mouldings are inserted into the A-post cavities, which then expand during the oven phase of the painting process, to form light but rigid reinforcement. These increase the structural integrity of the A-post, contributing to the improvement in overall torsional stiffness and particularly reducing the header rail vibration. And there are differences to be found in the general construction of the sills and A-pillars too. These are differences that frankly can't be transferred as an easy retro-fit to the MGF. However, fortunately, that isn't the whole story. In addition to the panel alterations, the TF also gained a number of other little modifications - including three separate bracing bars - which, with a little ingenuity, can be fitted to an F.
The body bracing kit contains three main braces, which are shown above. 1: the front subframe brace. 2: the dash support brace. 3: Boot fire wall brace. On approaching the expert engineers who make up Vehicle Handling Solutions (VHS), they rapidly came to a solution for 'our' problem with MGF torsional rigidity. And given that these were the same guys who brought us the MG TF in the first place, it will come as no surprise that the kit they came up with comprises of similar brace components to those found hidden away on the TF! According to VHS' Alan Phillips, the major body in white changes mentioned above (sill structure and A-pillar) contributed approximately 10% of the TF's improved torsional rigidity. One gets the impression that the laws of diminishing returns had started to apply! Where did the remaining 90% come from? In part, it is through rigidly mounting the front and rear subframes: ditching the original squidgy rubber items for alloy. This is nothing new on the MGF - the Trophy 160 LE used exactly these subframe mounts to good effect, and are readily available to fit to any MGF. These perhaps contribute another 20% of that total 20% gain. And the remaining 70%? From those aforementioned body braces. There are three - and the iron work is shown in the figure opposite. Appropriately perhaps, these are bolted to the front, middle and rear of the car. Brace #1 is fitted to the front subframe. This is surprisingly easy: the rearmost mounting holes take off from existing mounting bolts. The only modification really required to get these to fit are to reverse the subframe airdam (a trick also employed on the TF) and drilling a couple of 10mm holes to mount the front ends of the triangulation bars. Brace #3 in the figure is the rear firewall brace. Given that the wall between the boot and the engine bay looks so weedy, it is difficult to imagine how this could significantly contribute to the torsional rigidity of the car - but it does - that triangulation really does make a difference to the stiffness over the rear of the F. Like the front bars, this is a relatively easy fit - the rear deck panel even has holes already pre-drilled to accept the required 10mm bolts (what where they originally intended for???). All is required is for the engine inspection cover plate to be drilled in the appropriate places, and - the harder bit - a bracket welded to the middle of the firewall. What is involved in fitting these braces? First off, to fit the front cross member bars, two 10mm holes need drilling in the front corners of the subframe. The rear of the brace is bolted to the existing subframe mounts. 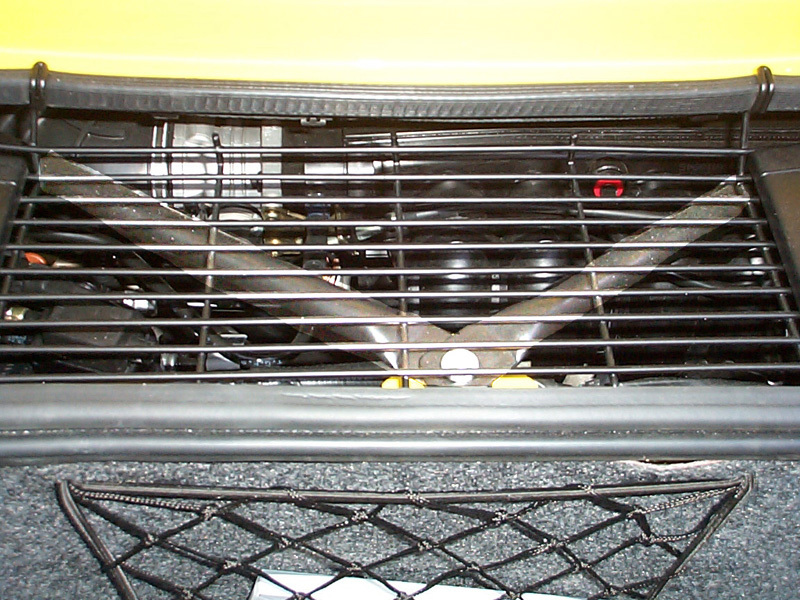 The picture opposite shows the triangulation in place, and the two braces bolted together under the spare wheel well. Now the brace support bracket can be welded to the rear firewall. Once this is achieved, the cross braces can be installed - as this images shows (actually on a TF!). The other end of those bars bolt up through existing holes in the parcel shelf - all that needs to be done is for the inspection cover to be drilled in the appropriate places. 5. The tricky one: the dash support bracket. First job is to strip out the dashboard - clearly not a task for the feint hearted. Andy 'Scarlet Fever' Phillips has a brilliant section on his website covering the removal of the dashboard - look at www.sfforever.co.uk/ for more details. 8. But first, you need to weld in a couple of brackets on the cross-member (as arrowed in this picture), and additional strengthening plates inserted onto the transmission tunnel (not shown). 9. Now you have the fun and games of putting everything back together again (it does go back, honest! This is Dave's car by the way, the green car in the pictures above are of mine). 10 Once everything is back in, time to go out for a nice drive on your favourite twisty country road - you'll notice the difference immediately! VHS, or Vehicle Handling Solutions Ltd, to give the company its full title, is a newly founded company with an extensive expertise in chassis design and development. Want to know what is on their CV? Well, Alan Phillips, Andy Kitson and Wayne Nation all worked at MG Rover in Rob Oldaker's chassis development team, developing the widely acclaimed MG derivatives of Rover's saloon range. And of course, they were also closely involved in the development of the MGTF. So as a group of enthusiastic engineers with impeccable credentials when it comes to knowing our MGs, who better to be let loose on improving your MGF? I can't think of anyone! The guys can be contacted via their website, www.vehiclehandlingsolutions.com/ or on 07871 156137. If all your driving is on motorways, you'll probably come away feeling somewhat disappointed, because driving along a long, straight, well-surfaced road really does not tax the suspension at all. But there are gains to be noticed even here. The steering feel has improved for example, even through the muffling hand of EPAS. But take your MG out onto a twisting country road - particularly one that you are very familiar with - and the benefits of this kit really start to be hammered home. It's all quite subtle at first, and hard to put your finger on, but now the car really seems to flow through the twisty sections, all of a piece. Acned road surfaces still bang into the interior, but there isn't that secondary body movement anymore - the ride feels smoother - as though the suspension is being removed from its shackles and being allowed to work as its designers intended. The steering is great too - yes, there is more communication. But there is also less corruption from the scuttle shake. Okay, scuttle shake is not completely removed, and the rear view mirror tends to vibrate more, probably because high frequency road vibrations are telegraphed more clearly through into the body's structure thanks to those solid subframe mounts. But never, ever, does the ride feel poor. Quite the opposite - the Hydragas continues to soak up the bumps in the same way Alex Moulton intended them to. But now, we're getting more communication.